What began as a seemingly routine surrogacy situation evolved into an international news story and a protracted court case, due to the emergence of some unique twists and turns in the case. Ultimately, the California courts rejected a surrogate’s efforts to be declared the legal parent of the triplets she delivered. The Second Appellate District Court concluded that the agreement the woman signed was legal and was entered into knowingly and voluntarily, meaning it was enforceable, and the surrogate was not entitled to parental rights. The case appeared to start out as a fairly routine surrogacy relationship. The would-be parent was a single man. The surrogate was a woman who had been a surrogate before. As part of the arrangement, the woman signed a 75-page long “Surrogacy Agreement” that spelled out the terms of her relationship with the entity and the would-be father. She initialed each page in the document. The father’s sperm was combined with a donor’s ova and implanted in the surrogate in August 2015. By September, doctors discovered that the surrogate was carrying triplets. The father allegedly requested that the surrogate abort one baby. The surrogate refused. She then sought to be declared the children’s mother and to be granted custody of at least the one child who would have been aborted. The father asked that the courts declare him to be the sole legal parent of all of the children. With the legal contest ongoing, the surrogate, whose ongoing battle with the father has been reported in various sources, including people.com, delivered three baby boys. The trial court ruled for the father. The appeals court also ruled for the father. The appeals court described the surrogate’s appeals arguments as an all-out attack on the constitutionality and enforceability of surrogacy agreements in California, and it concluded that the arguments were not persuasive. California Family Code Section 7962 governs relationships like this. Section 7962 requires several things from a surrogacy agreement. It must contain a date of execution, the source of the genetic material, the identity of the intended parent, and a procedure for how medical expenses would be addressed. This agreement had all of those things. The surrogate’s constitutional claims could not possibly succeed because both the court here and the legislature had already concluded that surrogacy arrangements were consistent with the public policy of the state and did not trigger any constitutional violations. The state Supreme Court declared surrogacy agreements constitutional in a 1993 case entitled Johnson v. Calvert, and Section 7962 was created to enshrine the Calvert ruling and another case decision (In re Marriage of Buzzanca) into statutory law. Regardless of how seemingly routine or how unusual your case may appear, you need skilled California counsel working for you. 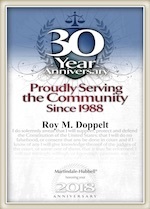 The diligent San Diego child custody attorneys at Roy M. Doppelt & Associates have been assisting clients throughout Southern California, including in San Diego, Encinitas, La Jolla, and Chula Vista, for many years. For a free consultation, reach out to Roy M. Doppelt & Associates through our website or call toll-free at (800) ROY IS IT (769-4748).